According to the report, the global hybrid additive-manufacturing machines market is likely to be influenced by the increasing adoption of hybrid additive-manufacturing machines across a wide range of industry verticals such as heavy industry, automotive, aerospace, and medical. Asia Pacific is projected to be at the forefront of global demand, with the market in the region expanding at a CAGR of 24.16% between 2018 and 2026. The global hybrid additive-manufacturing machines market is expected to reach US$ 6,757.1 Mn by 2026. The market is projected to expand at a CAGR of 21.69% during the forecast period. Based on application, the global hybrid additive-manufacturing machines market is segmented into repair, production, and prototype. There has been a shift in the manufacturing of complex components by means of additive manufacturing instead of conventional manufacturing methods. Complex components with complex geometries are being manufactured efficiently with the help of hybrid additive-manufacturing machines, as the material is added layer by layer for the production, instead of milling out the material to carve the shape. This results into reduced time for production and significant savings in the material being used. This further results in reduced cost of production of components. In terms of vertical, the hybrid additive-manufacturing machines market is segregated into heavy industry, automotive, aerospace, medical, energy, electronics, and others. The aerospace segment is expected to hold a prominent share of the market, owing to the rising rate of adoption of additive manufacturing methods for manufacturing of critical components in the industry. The aerospace industry requires the manufacturing of complex components that are light weight and robust in nature. These components can be manufactured efficiently with the help of HAM machines instead of conventional manufacturing methods. In January 2018, Airbus, a prominent players in the aerospace industry, collaborated with Switzerland-based technology group, Oerlikon, for the manufacturing of structural titanium components for the company. North America is expected to hold a major share of the global market for hybrid additive-manufacturing machines during the forecast period. The expansion is primarily due to the booming hybrid additive-manufacturing machines marketplace with the presence of well-established players across the region, especially across countries such as the U.S. and Canada. Furthermore, North America is witnessing significant adoption of hybrid additive-manufacturing machines owing to the consistent expansion of the automotive industry. The market in Europe is projected to expand at a significant CAGR during the forecast period. Additionally, many associations in the manufacturing space are entering into strategic partnerships to improve and promote their additive-manufacturing capabilities. For instance, In February 2018, CECIMO, a Europe-based association of the machine tool industry signed an agreement with EPMA, European Powder Metallurgy Association for the promotion of additive manufacturing and to support the industry in Europe from one application of 3D printing to the other. Hybrid additive-manufacturing machines are gaining popularity across Asia Pacific, especially across the economies of China, Japan, and India. Increasing awareness in the region pertaining to the advantages associated with additive manufacturing and HAM machines is expected to fuel the hybrid additive-manufacturing machines market in the region. China is projected to hold a significant share of the market owing to the presence of industries with potential adopters of HAM machines for manufacturing of complex components. DMG MORI Co., Ltd., Mazak Corporation, Matsuura Machinery Corporation, Stratasys Ltd, voxeljet AG, Optomec, SLM SOLUTIONS GROUP AG, are some of the major players operating in the hybrid additive-manufacturing machines market profiled in this study. Details such as financials, SWOT analysis, business strategies, recent developments, and other such strategic information pertaining to these players have been duly provided as part of company profiling.. Also, market players are establishing partnerships, entering into strategic M&A, and expanding in order to enhance their hybrid additive-manufacturing machines offerings worldwide. The “Hybrid Additive Manufacturing Machines – Global Industry Analysis, Size, Share, Growth, Trends and Forecast, 2018 – 2026”, report provides analysis of the hybrid additive-manufacturing machines market for the period 2016 to 2026, wherein the years from 2018 to 2026 is the forecast period and 2017 is considered as the base year. Data for 2016 has been included as historical information. The report covers all the trends and technologies playing a major role in the expansion of the hybrid additive-manufacturing machines market during the forecast period. It highlights the drivers, restraints, and opportunities expected to influence the expansion of the market during this period. The study provides a holistic perspective on the expansion of the market , in terms of revenue and volume (in US$ Mn and Thousand Units), across different geographical regions, namely, North America, Europe, Asia Pacific, Middle East & Africa, and South America. The report highlights the key trends affecting the market on a global scale. Furthermore, region-wise prominent countries/regions covered in the report include - The U.S, Canada, Germany, France, the U.K., India, China, Japan, GCC countries, South Africa, and Brazil. This report analyzes and forecasts the market for hybrid additive-manufacturing machines at the global and regional level. The market has been forecast, based on revenue (US$ Mn) and volume (thousand units), from 2018 to 2026. The study includes drivers and restraints of the global hybrid additive-manufacturing machines market. It also covers the impact of these drivers and restraints for hybrid additive-manufacturing machines during the forecast period. The report comprises a detailed ecosystem analysis, which provides a comprehensive view of the global hybrid additive-manufacturing machines market. The Porter’s Five Forces model for the hybrid additive-manufacturing machines market has also been included to help understand the competitive landscape in the market. The study encompasses market attractiveness analysis, wherein, end-users are benchmarked based on their market size, growth rate, and general attractiveness. This research study on the global hybrid additive-manufacturing machines market provides a detailed cross segment and cross country analysis based on the different segments including application and vertical. Based on application, the market is segmented into repair, production, and prototype. Furthermore, based on vertical, the market is divided into heavy industry, automotive, aerospace, medical, energy, electronics, and others. 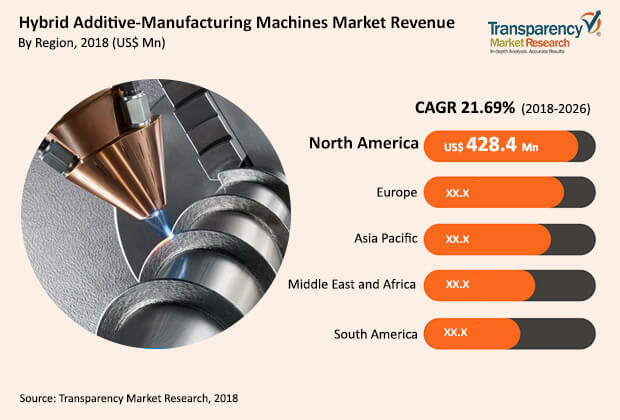 The report includes well-established players such as DMG MORI Co., Ltd., Mazak Corporation, Stratasys Ltd, voxeljet AG, Optomec, SLM SOLUTIONS GROUP AG, Matsuura Machinery Corporation, and Renishaw Plc. These are some of the well-established players engaged in the introduction of innovative products in the market. For instance, in June 2016, Matsuura Machinery Corporation introduced Matsuura LUMEX Avance-60 model into the market, which can build parts in 3D at a speed of 36 cubic centimeters per hour in its standard mode. The company claims that this model is ideal for manufacturing intricate components that cannot be manufactured by conventional methods of manufacturing.